The most difficult part of any renovation is managing contractors. Most in the business are honest and responsible. But no one would deny there are a few bad eggs. Here’s an article that can help, by discussing a ‘reiterate-and-confirm letter’. Did you know that you can create a binding agreement without securing the other party’s signature? 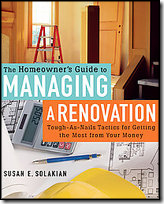 A simple letter that I call a "reiterate-and-confirm letter…"
It’s from a book called The Homeowner’s Guide to Managing a Renovation, by Susan Solakian. This entry was posted on Tuesday, January 20th, 2009 at 9:14 am	and is filed under Contractors. You can follow any responses to this entry through the RSS 2.0 feed. You can leave a response, or trackback from your own site.